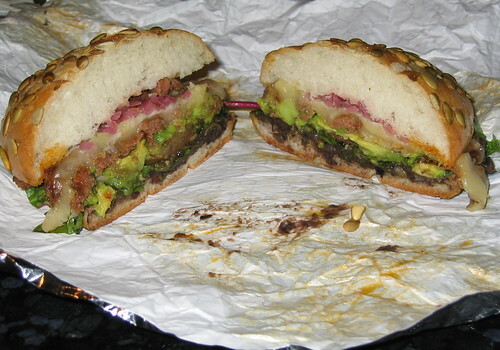 Here it is, the Toluca from BomBon Cafe. It has chorizo, mixed greens, tomato, avocado, pickled red onions, Oaxaca cheese and bean spread, and man is it tasty. All for only $6.95. This introduces a couple of themes. One, I love chorizo. Two, I love sandwiches. So it should not come as a surprise that this is on the short list for “top food experiences in Chicago.” In fact, the delectable nature of this sandwich inspired this blog. Take another look at that cross-section; it is truly a thing of beauty, especially when you consider I got it takeout so this is how it looks after sitting sideways for the 10 minute trip up Ashland. Stupendous my friends. BomBon Cafe should not be missed. It is at 38 South Ashland in Chicago and is an off-shoot of the original BomBon Bakery in the heart of Pilsen at 1508 West 18th. I have been to the Cafe twice and had this sandwich both times, but I am branching out the next time because there is a ton of good stuff on the menu. Also, be sure and grab a tres leches for the road. They usually have about five flavors to choose from and all are good. Posted in food on 2006/12/07 by John.